Annabelle pressed her back against the cold and damp brick-wall, closed her eyes, and attempted to regulate her breathing. The more she tried to be still and quiet, the more her body trembled and her breath wheezed out in long, hard huffs. She could hear the car approaching, and she pressed even tighter against the wall, hiding in the shadow of a ventilation duct that curved and twisted, seeming to slither up the side of the large office building. In a low, breathy whisper she prayed the car would pass the alley without slowing. If he stopped, Annabelle would be trapped. The narrow alley was only a small slice into the massive body of the towering city, and at the end, another brick wall loomed twenty stories above her. A row of rusted and beaten dumpsters that looked like they might once have been blue gaped at her, their lids propped open by overflowing trash. The only light came from the orange glow of the street lamps that cast a triangular pattern down the center of the pavement. As the car reached the gaping mouth of the alley and Annabelle held her breath, something wet and furry skittered across the top of her open-toed shoes. Squealing loudly, Annabelle rapped the back of her head on the wall as she lurched forward out of the shadows and into the narrow slice of light. She quickly slammed her body back against the brick surface and stifled a cry as she willed herself to disappear into the rough wall. Did he see her? Hear her? 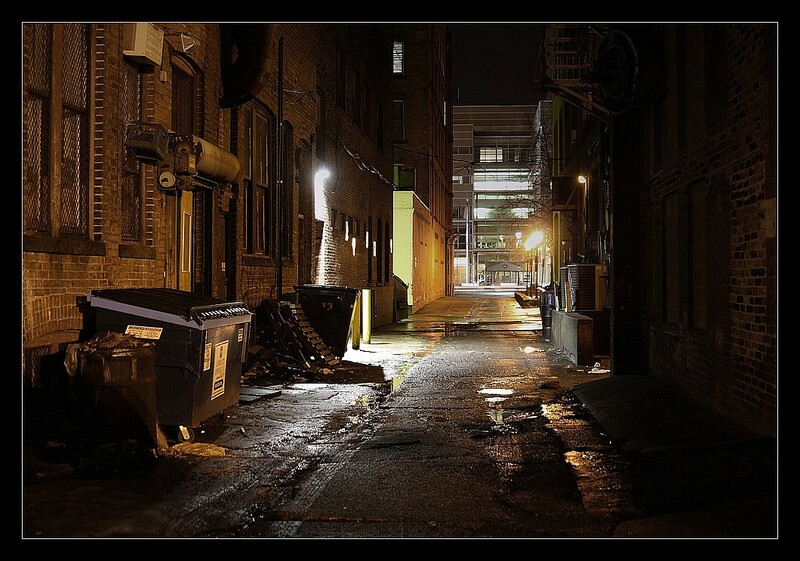 She could hear the car idling at the mouth of the alley, and she had just about decided to try scrambling up the ventilation duct when the towncar pulled away. Not sure how much time had passed – it felt like an hour but was probably only three or four minutes – Annabelle slowly made her way to the opening of the alley. Her slim frame was still trembling, and the back of her pencil skirt and suit jacket were wet. She silently thanked herself for choosing her black suit and prayed the dirt and whatever else she had picked up from the wall didn’t show up on the dark fabric. The bun she had twisted her dark brown hair into that morning was showing signs of wear. Stray strands were escaping and fleeing in various directions, and her small, elfin face was pale and covered by a sheen of sweat. Heart still thundering, Annabelle cautiously peered around the corner and down the street. Her eyes were wild as they scanned the rows of cars parked along the curb. She saw nothing but a boneyard of steel and concrete, deserted and cold, and the image gave her a brief chill. But the town-car was gone. After a brief internal debate, she shrugged out of her suit jacket and stuffed it into the briefcase that held her laptop and the real estate brochures for the apartments she had shown earlier that afternoon. She freed her escaping hair from the confines of the messy bun and shook it out until it obediently fell into place. As far as disguises went, it was the best she could do. Annabelle slowly emerged from the alley like a chastised dog, head down, shoulders hunched, and her eyes darting back and forth as she quickly made her way to the corner of Second Avenue and Main Street. Beyond that point, there would be more people, more open shops and bars, and she would only be two blocks from her apartment. always emphasize doctor exams over laboratory tests.